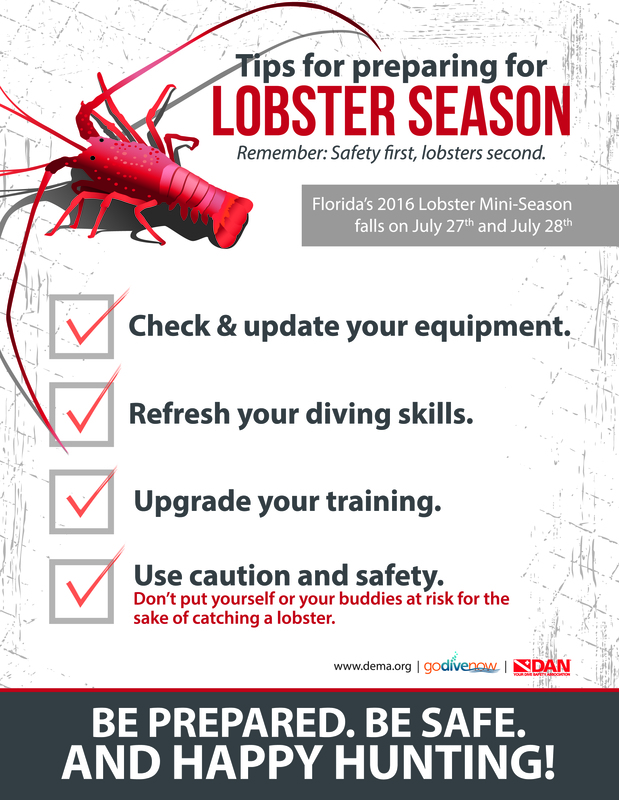 With the 2016 Florida Lobster Mini-Season happening this month, DEMA has updated their Lobster Mini-Season poster and is circulating a 30-second Public Service Announcement in an effort to increase diver safety. Both the poster and PSA remind divers to be prepared for the upcoming mini-season. DEMA Members are encouraged to print the Lobster mini-season poster and to display it in the store, distribute it to their customers, and share it electronically, along with the video PSA, with their own online community. Both the poster and PSA are part of DEMA’s ongoing campaign to encourage divers to refresh their training and maintain their equipment prior to getting back in the water. The 30-second PSA was produced by DEMA in partnership with Divers Alert Network and specifically timed for the two-day Florida Lobster mini-season opening on July 27 and ending July 28. It was created to encourage divers to visit their local dive center to update their dive equipment and refresh their dive skills ahead of the two-day mini-season. 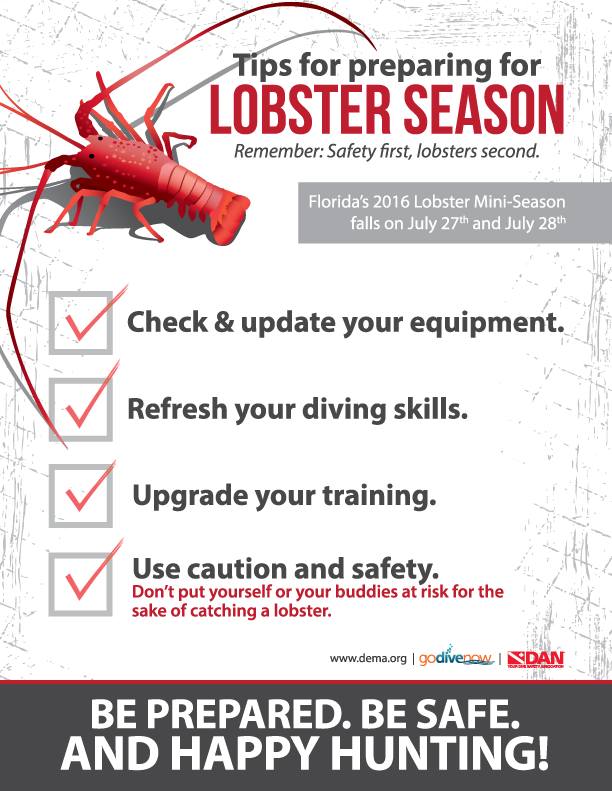 In addition to being made available to the Industry for download and sharing, the poster and PSA will be promoted as a social media campaign via DEMA and Go Dive Now’s social media pages prior to and during the Lobster Mini-Season. The poster is now available to be viewed, shared and downloaded and the PSA can be viewed and shared via the Go Dive Now YouTube channel. All divers and Industry Professionals are encouraged to share the PSA with their social media friends and followers and their local diving community to spread this important message.